Frederick Luis Aldama, Professor in the Department of English at The Ohio State University, will present a public lecture titled Real & Reel Latinx Lives Matter! A light reception and book signing will follow. The Hammes Notre Dame Bookstore will be onsite for book sales. For “Real & Reel Latinx Lives Matter!” Aldama will unzip his brain, offering a multimedia extravaganza of all things Latinx in the 21st century. This includes an exploration of contemporary mainstream film, TV, music, animation, comic books, video games that simplifies and straightjackets Latinx identity and experience. He contrasts this with today’s abundance of Latinx created cultural phenomena that vitally complicates and enriches our understanding of Latinx identity and experience. Along the way Aldama presents a dynamic model for understanding Latinx subjects as active transformers of the world we live in today. 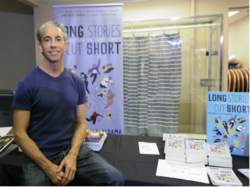 Frederick Luis Aldama was born in Mexico City to a Guatemalan/Irish American mother from East Los Angeles and a Mexican father from Mexico City. He publishes and teaches courses on Latinx literature, film, TV, music, sports, video games, and comic books. He is the author, co-author, and editor of over 30 books, including his first book of fiction Long Stories Cut Short: Fictions from the Borderlands. He is editor and coeditor of 8 academic press book series. He has been honored with the American Association of Hispanics in Higher Education’s Outstanding Latino/a Faculty Award. In 2017 he was inducted into the Academy of Teaching and the Society of Cartoon Arts.